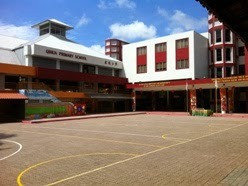 Qihua Primary School is located at 5, Woodlands Street 81 in Singapore 738525. It is enclosed within the Woodlands Region. Woodlands, now called Woodlands New Town, is a sub-urban town that is situated at the Northern Section of Singapore. It is known for it countryside lifestyle. Nearest MRT is Woodlands MRT station and the closest bus interchange is Woodlands Regional Bus Interchange. Amenities in the area include Woodlands North Plaza, Causeway Point and Woodlands Civic Center. Some of the schools nearby are Riverside Secondary School, republic Polytechnic and Evergreen Secondary School.